Sanda Shoes is one of the brands from the 1950s through 1970s which is permanently etched in the memories of most HK residents. 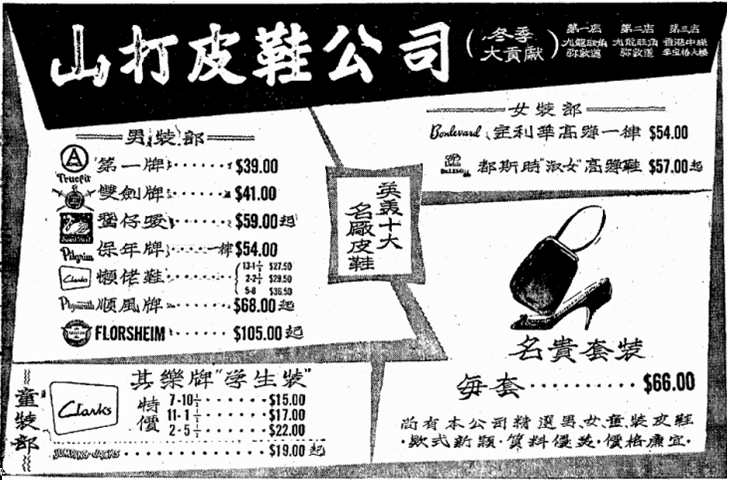 With a chain of at least 5 shoe stores in HK and Kowloon, Sanda was a leading local shoe brand along with brands covered earlier such as Crane, Po Shing, Fung Keong and others such as Po Fong. It also manufactured its own “Manning Shirt” in the 1960s although that never really caught on and is largely forgotten today. Sanda was founded in the mid-1950s by Yeung Nai-ying (楊乃英 or 楊乃瑛), a merchant involved in the trading of leather materials (for shoes and other leather goods) and woolen piece goods through Yue Tai Cheung Ltd (裕泰祥) at 11-13 Wing Kut Street and Lee Fung & Co (利豐公司) at 35 Jervois Street. The first two Sanda outlets were located on Nathan Road in Mongkok – 587-589 and 630-632A. On December 1957, the third Sanda store opened at Li Po Chun Chambers in Central. 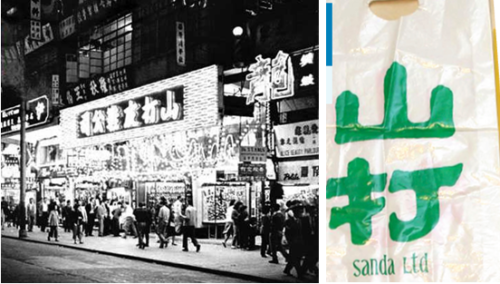 Two years later on December 28, 1959, the fourth Sanda store opened on the ground floor of Man Yee Building (萬宜大廈) in Central. The location was considered the top shopping destination in HK at the time with the first escalator in its shopping arcade and the Sanda store was right next to Tom Lee Piano. In 1960, the fifth Sanda outlet opened at 225 Nathan Road next to the Shamrock Hotel in Tsim Sha Tsui. The same year, Sanda appointed Lee Say Co Ltd as the exclusive distributor in Singapore to market its Sanda shoes there and boasted itself as the largest shoe company in Hong Kong in terms of sales. In 1962, Sanda expanded into women and children clothing and in 1963, it expanded into men’s clothing by carrying foreign shirt brands such as Manhattan, Arrow, Truval and Bud Berma but also by launching its own Manning shirt. 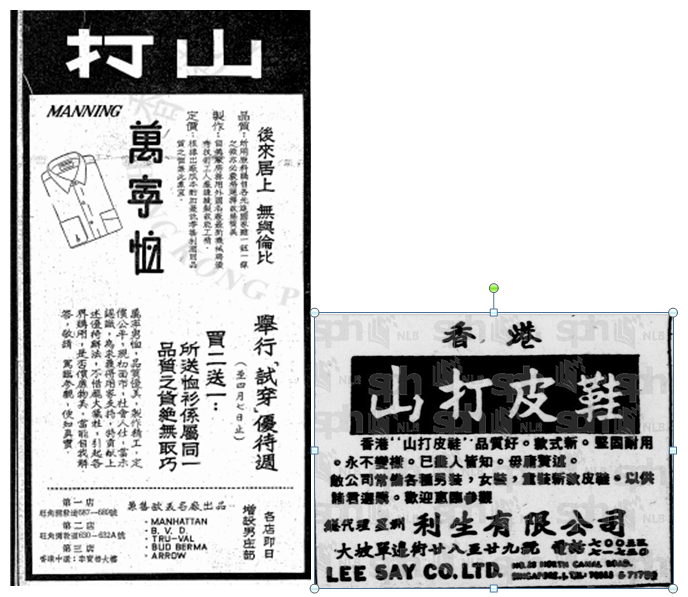 As covered in other articles earlier on this website the late 1950s saw a number of shirt brands emerging in HK – including Crocodile, Yips, Spear, Union V-tex etc. and Sanda decided to enter the business as well by setting up a shirt factory in 1157-1159 Canton Road in Kowloon and making shirts with high quality imported materials and state of the art equipment. Despite heavy marketing (such as Buy 2 get 1 sale), Sanda was late to the party and Manning Shirt never really caught on. More info is needed as to when Sanda went out of business and why. One source claims that the Sanda chain closed in 1973 (according to a minibus bus sign painter who worked there). Another source claims that the Yeung family of Sanda were astute investors in the stock market who bought up shares of blue chip stocks such as HK Electric and by the time Cheung Kong planned its acquisition of HK Electric they had accumulated 6% of the firm. Sanda Limited, the holding company of the chain, was incorporated in 1970 but dissolved in 1993. Yue Tai Cheung was incorporated in 1969 and also dissolved in 1993. This article was first posted on 23rd February 2018. The neon image at the top is a screen shot from the 1963 German film “Weiße Fracht für Hongkong”.